Children’s behaviour in the classroom depends on many factors: from their motivation, to their ability to control their emotions… to how the teacher speaks to them. 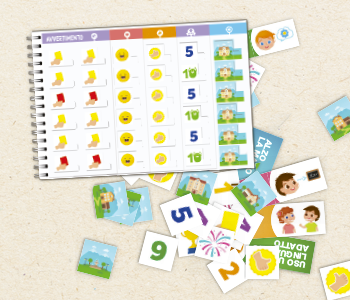 • goal stickers, to put on the board when all objectives have been reached. finish line stickers to place on the board once all goals have been reached. Feel good in class with the token economy! Created by psychologists Fabio Celi and Jonathan Lisci, this briefcase helps teachers structure and manage their students’ behaviour. 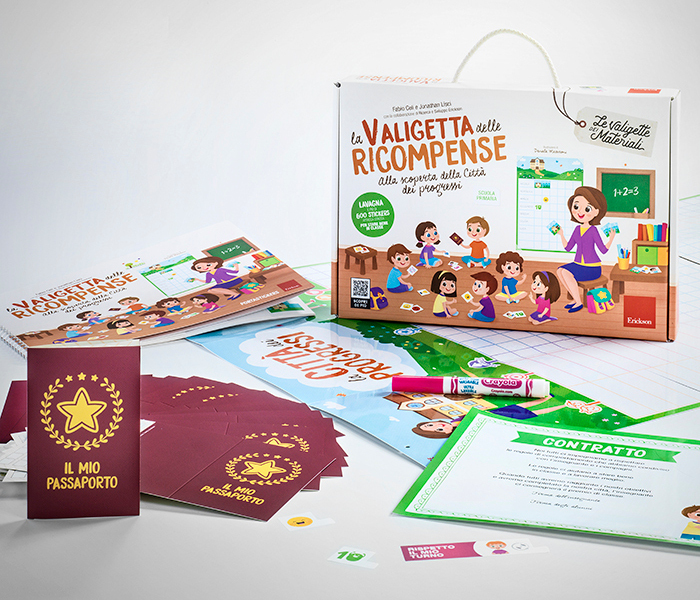 Based on the principles of the token economy, The Rewards Briefcase helps the teachers better structure his/her intervention in the classroom, thanks to the series of materials it contains. The “token economy” can be of great help in encouraging and assisting a child to improve his or her behaviour in class. The token economy is essentially based on two concepts. 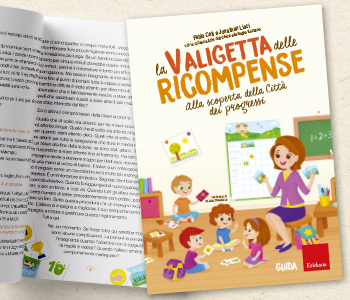 Concept number one refers to everything that a teacher can do prior to the student’s behaviour: establish and communicate clear, personalized and reasonable objectives to the child. Concept number two refers to everything that a teacher can do after the student’s behaviour: reinforce it (with lots of conviction!) when it is correct and punish it (very cautiously!) when it is not. The token is a symbolic reinforcement which signals to the children that they have reached their mini-goal. If the child behaves well, he/she earns a token. If the child misbehaves, he/she loses it. The board, to be hung in class, is used to apply the token economy program. On the board, the children’s names and the behaviour objectives to be reached are written. Beside these, the token stickers are placed (from 1 to 10), as the children gradually earn them through correct behaviour. There is also a place on the chart for “social reinforcer” stickers (thumbs up, victory symbol, trophy, fireworks) and warning stickers in case negative behaviour occurs (yellow card and red card). 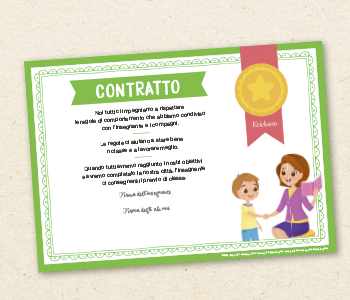 Moreover, each child can add a feeling sticker for the day, as a self-evaluation tool (sad face, happy, angry…). 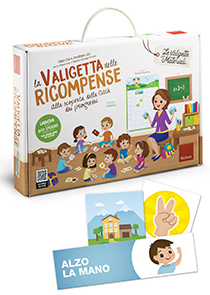 Contains more than 600 stickers to place on the board (stickers with behaviour objectives, tokens, “social reinforcer” stickers, warning stickers, and feeling stickers). 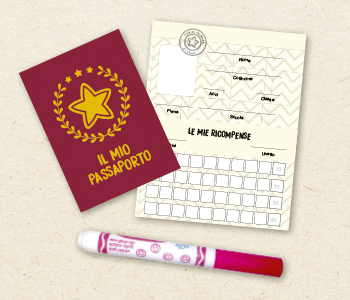 A passport for each child to keep track of the tokens earned by using the special marker-stamper. 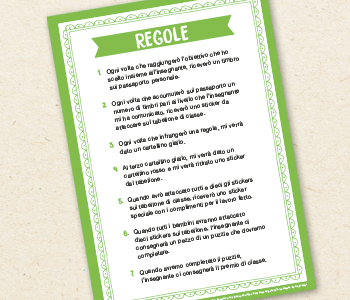 It formalizes the commitment that the students make together with the teacher and classmates to respect the behaviour rules that have been shared. This should be hung in class alongside the board and the rules. The guide contains indications for the teacher for the proper use of the tools found in the rewards briefcase. The teacher as well as the students should use it creatively, putting in a lot of themselves and considering their daily experiences. Fabio Celi Psychologist, psychotherapist, director of the O.U.C. (Operative Unit Complex) of Psychology for USL Toscana northwest, he is professor of clinical psychology at the Universities of Parma and Pisa. Jonathan Lisci Psychologist, psychotherapist and socio-educational worker, he deals with children with hyperactivity and relationship difficulties.